Research was conducted using the U.S. Department of Labor's O*NET to consider characteristics of jobs that are more likely associated with persons with disabilities and their non-disabled peers. Results illustrate and evaluate whether persons with disabilities are in different kinds of jobs and how 'in demand' specific job types are. 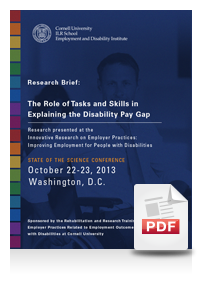 In addition, whether persons with disabilities are over- or under-represented in the fastest growing jobs is discussed.